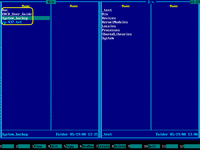 Emergency Boot Kit File Manager can copy files from your computer, even unbootable one, to external USB thumbdrive or USB HDD. Save your data in emergency situation when Windows no longer boots. Supported filesystem types: FAT, NTFS, EXT2/EXT3, ISO9660, UDF and BSD UFS; Unicode is fully supported for all of them. 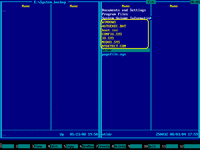 Builtin editor and viewer for text files can handle numerous ANSI/OEM encodings and UTF-8/UTF-16. Removable disks e.g. 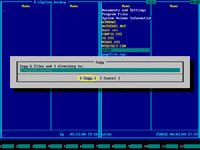 USB and Firewire are mounted and dismounted automatically, like floppy disks in Windows. 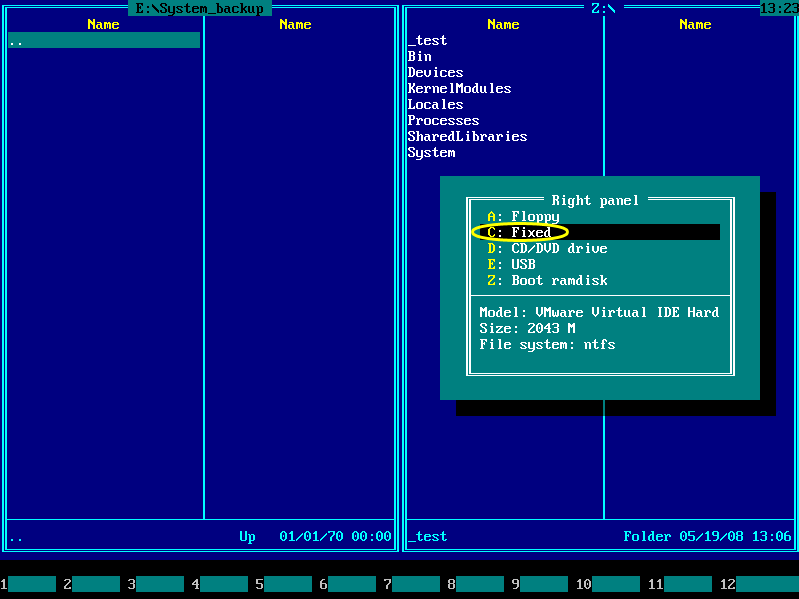 Boot in Emergency Boot Kit, choose "File Manager" in the main menu. Open the drive you are going to backup to, in the one of file manager panels. To do this, press Alt+F1 key. In popup window choose target drive using ↑ (UP) and ↓ (DOWN) keys, then Enter or by clicking it. 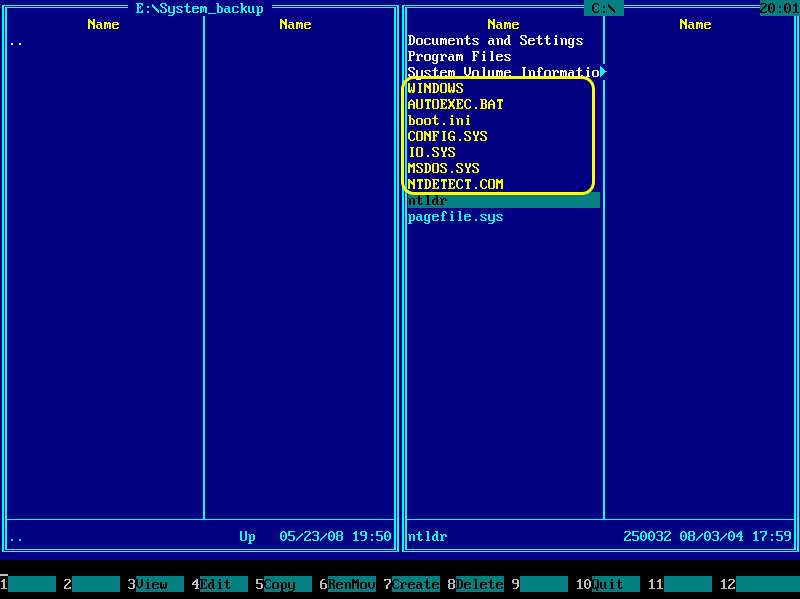 The following screenshot shows choosing of drive E: (USB flash thumbdrive). 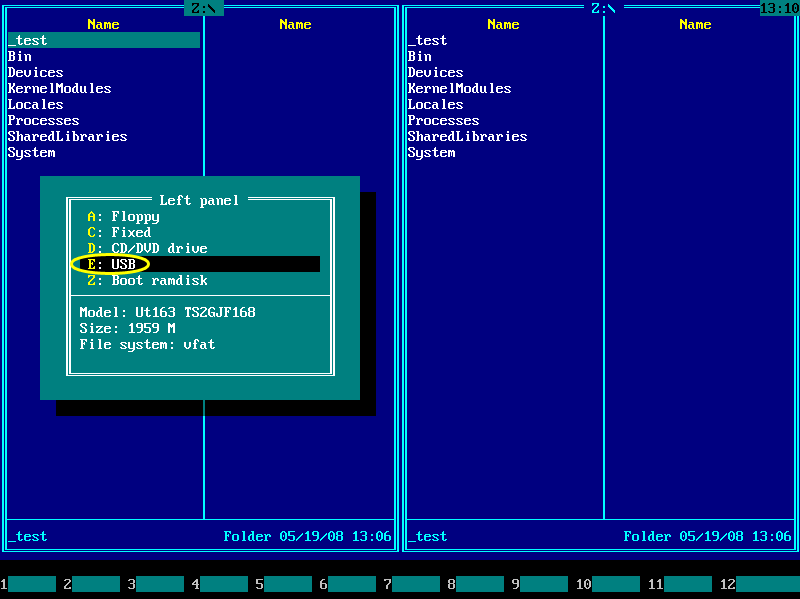 Left panel should display contents of chosen drive. 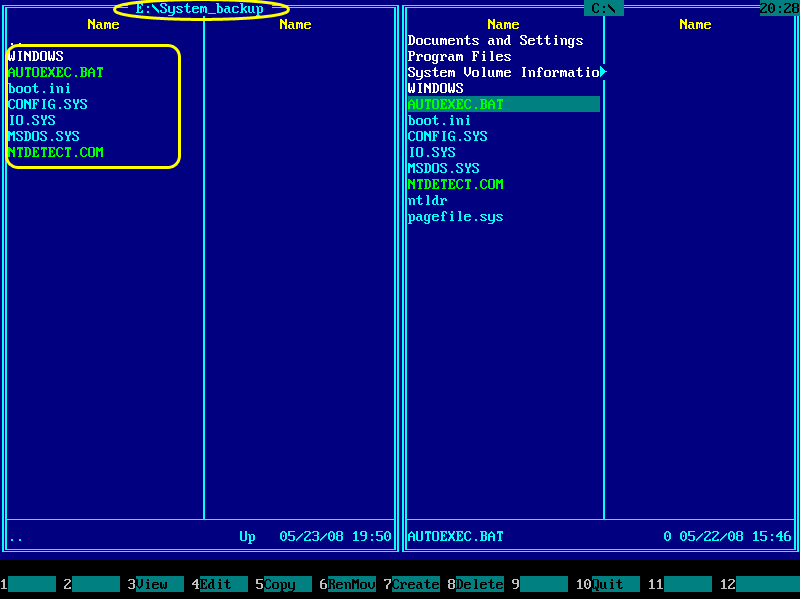 In this example, it shows contents of drive E:. 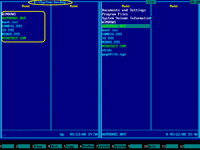 If target folder already exists, enter into it in file manager. If this folder is non-empty, delete its contents or use some other folder for backup. If backup drive does not yet contain target folder, then you may create it (F7). In another panel of file manager, choose source drive for backup. Press Alt+F2 to do this. 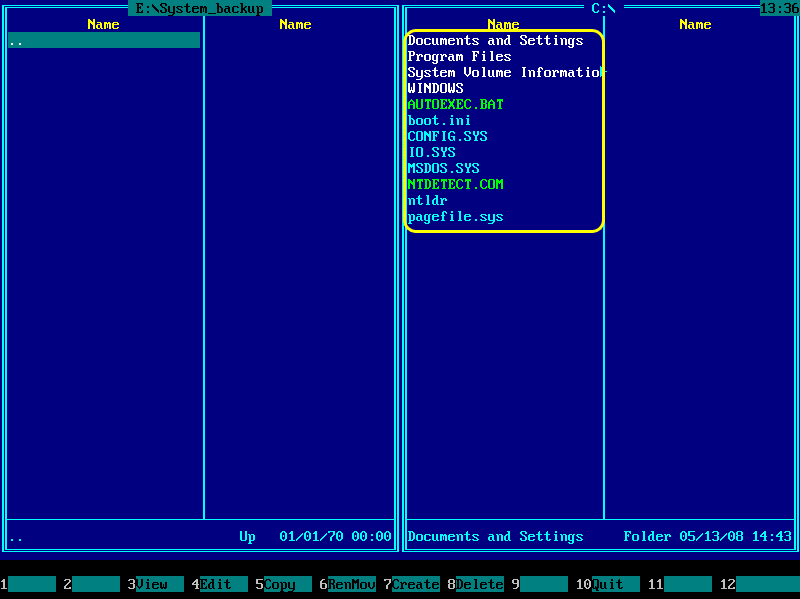 Select files and folders to backup (on right panel). Use Ins key to mark them yellow, also you can use NumpadPlus and NumpadMinus to mark/unmark by file name mask like *.docx. 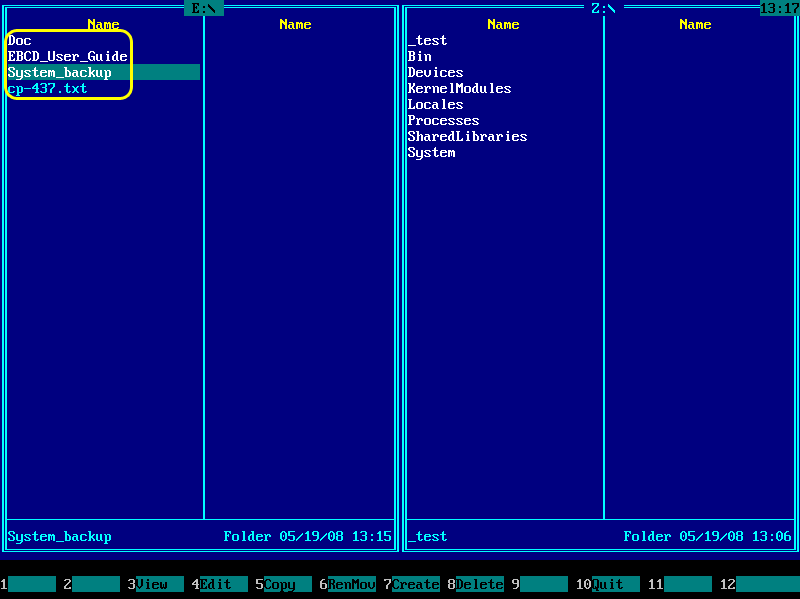 The following screenshot shows right panel with selected files, ready for backup. 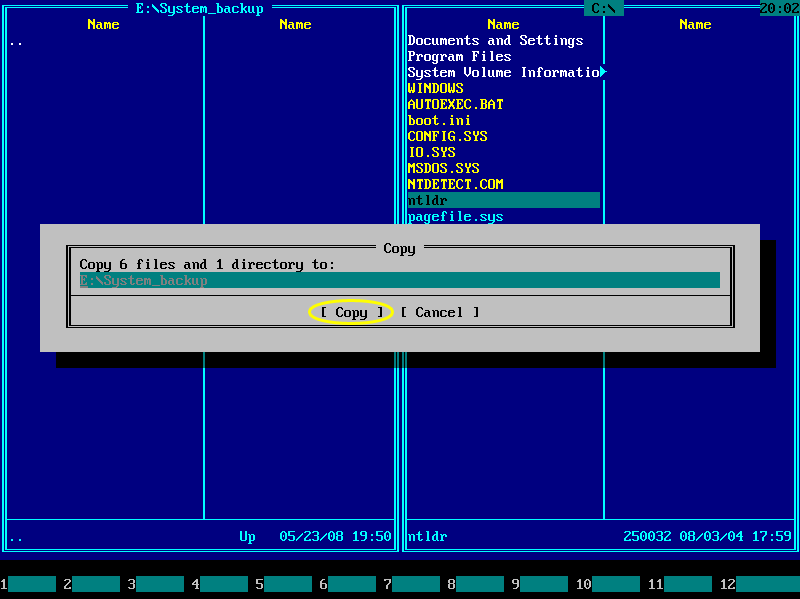 To copy selected files and folders (right panel of file manager in this example) to destination folder on the backup drive (left panel in this example) press F5 key, while right panel is active (Tab key changes active panel). A popup window should occur. Press Enter key or click Copy in popup window to confirm target path. Backup process should start immediately. 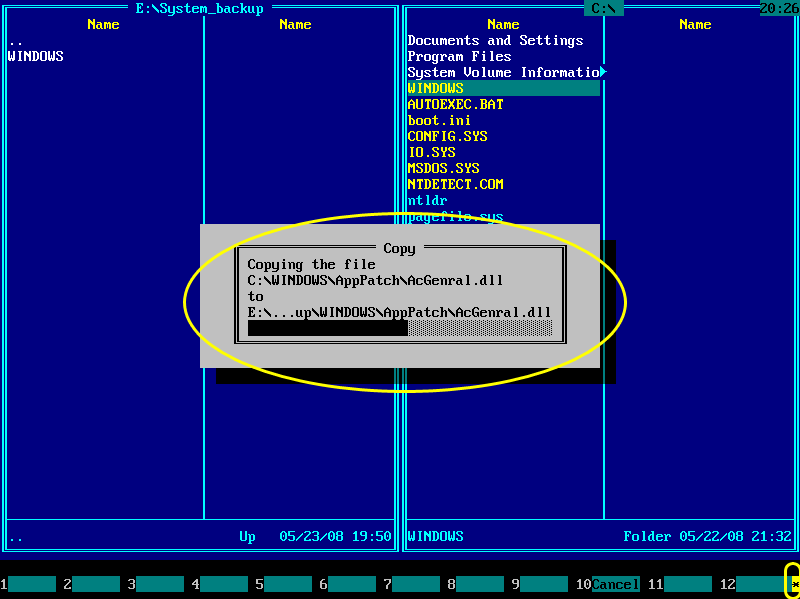 You should see progress window showing information about files being copied. If you backup to removable media, like USB flash, you should see asterisk on yellow background in the right bottom corner of your screen. Asterisk shows that removable device is in use now and you should not unplug or eject it. Wait until asterisk disappears and then unplug device or eject the disk. If you fail to do so, data loss may occur. 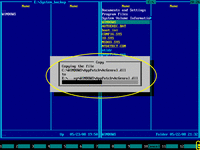 If you want to interrupt file copying, press F10 or Esc. When copying is done, progress window disappears. 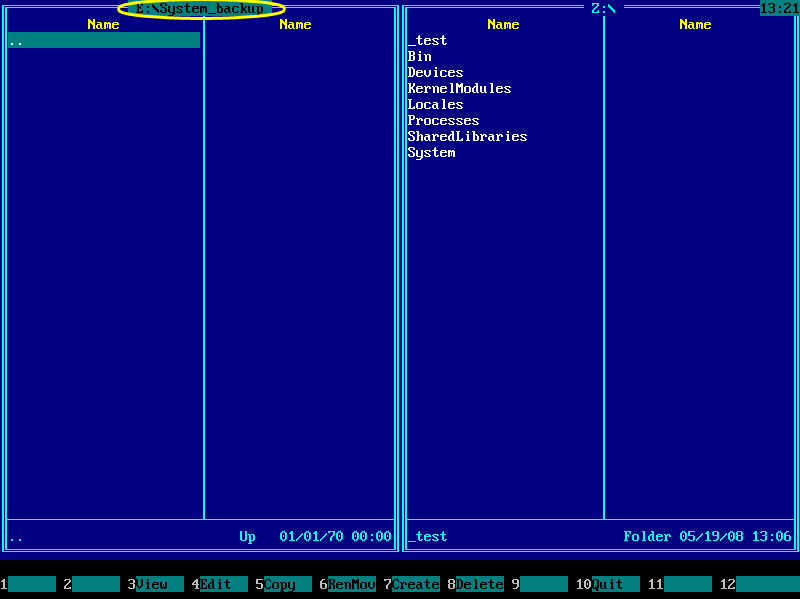 The last screenshot shows contents of System_backup folder of drive E: after backup.